Samuel De Wilde specialised in portraits of actors in role, often commissioned as illustrations by publishers of plays. From his studio in Covent Garden, De Wilde kept up a constant production line as actors came to pose for him. The young comic actor Thomas Collins (1775-1806) trained as a musician in Bath, but followed his father into the theatre. 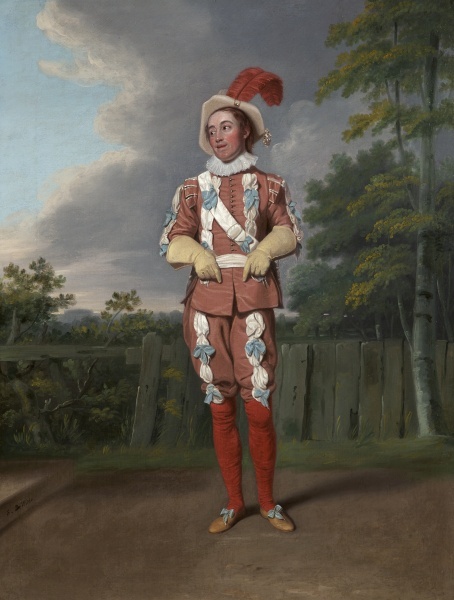 He wears a brightly-coloured, fanciful evocation of the dress of Shakespeare’s day, based on early seventeenth-century paintings.